The school year has just begun and already a national dialogue is taking place between school administrators, law enforcement and students about bullying – how to spot it, how to stop it. Parents have a crucial role to play as well. When you think of a bully, you may picture a tough guy who picks on a smaller boy and steals his lunch money. While that conduct would fall within the definition of bullying, there are, unfortunately, a wide variety of bullying behaviors. The broad definition used by the Olweus Bullying Prevention Program developed by Clemson and sanctioned by the South Carolina Association of School Administrators is “when someone repeatedly and on purpose says or does mean or hurtful things to another person who has a hard time defending himself or herself.” Bullying differs from other kinds of aggression between students in that (1) it targets a specific individual and isn’t accidental; (2) it is repetitive; and (3) there is a power imbalance between the students. Bullying can take the form of verbal abuse, social exclusion, physical abuse, spreading lies and rumors, stealing or damaging property, and making threats. 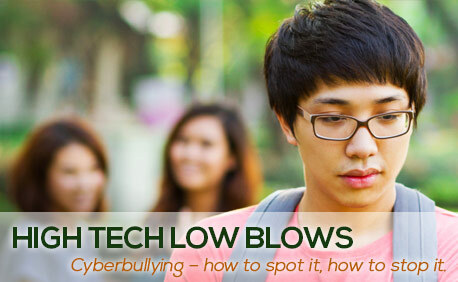 But as technology has changed other aspects of our lives, so has it changed bullying. A new word has entered our vocabulary, a new threat from which to protect our children: Cyberbullying. Easy and almost universal access to cell phones, instant messaging, mobile devices, social networking and other technologies has enabled bullies to cause widespread harm, at lightning speed, and to do it anonymously. Sometimes cyberbullying involves creation of a website or blog on which the bully posts embarrassing pictures, messages which were intended to be private, or threats. Such posts can quickly “go viral,” causing devastation and even suicide attempts. Statistics about students’ internet usage, based on Pew study results, might surprise you. 75% of teens (ages 12 to 17) have a cell phone. 27% use their cell phones to go online. 95% of teens go online. 80% of teens who go online use social networking sites. Statistically, there is a good chance your child may already have been a victim of cyberbullying. South Carolina anti-bullying laws are found in S.C. Code Annotated Section 59-63-110 to -150, the Safe School Climate Act. They cover cyber bullying as well as other forms of harassment or intimidation. Under the Act, bullies may be punished not only for classroom conduct; they may also be punished for bullying on school grounds, on a school bus, at a bus stop, at a school event away from school premises, or at any other function in which the school is responsible for the child. Let your child know that it’s OK for them to use phones and computers and to go online, but that you want them to be safe. Ask your child’s peers and neighbors and friends to watch out for hurtful messages so that you will be aware if cyberbullying is occurring. Remind your children that they don’t really know who is on the receiving end of cyber communications. Tell them not to say or do anything online that they wouldn’t say or do in person. Teach your children not to reveal anything that you wouldn’t tell a stranger, because the information could very well fall into the hands of a stranger. Advise them never to share email passwords, photos, personal data or private details about their lives. Know what your children are doing online. Safety is more important than privacy. According to the South Carolina Department of Education, bullying is at its peak in middle school. By the time they reach high school, one in four students lists bullying as their main fear. Parents, don’t leave it all up to the schools, and don’t put it off – help strike a blow against bullying. We have listed below some of the resources that will help you discuss bullying with your child and know what to do if your child is the victim of a bully, cyber or otherwise.